GREAT ALIEN CRAFT PHOTO FROM ALBUQUERQUE N.M. 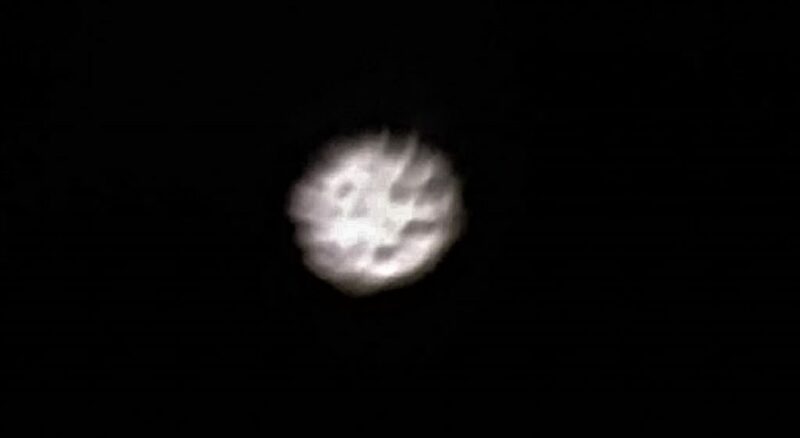 I had gone outside on my front patio to smoke before going to bed when I saw this object. The weather was completely clear in my area with possibly a few clouds in the distance. As soon as I sat down on my patio chair and lit my cigarette I looked up from my cigarette somewhat straight ahead, saw this object and immediately thought there was no way it was the moon. It seemed to be vibrating so I quickly snapped these photos to analyze them logistically thinking it has to be the moon and I must not be seeing correctly because I’m tired and about to go to sleep. The first came out bright so I took another touching my photo screen camera to make it focus taking the second clearer photo of the object. I then analyzed the photo seeing it is not the moon. I then looked back up and it had disappeared. I then did a quick surveillance of the sky away from my patio but it was completely gone. During this I can’t recall having any sort of emotional feelings other than disbelief, I was not scared or anxious in anyway. Later I had sent the photos to some friends and family and they didn’t have any ideas of what it could be. After some time I just concluded it was strange and didn’t think much of it since. Recently, it had come back up in conversation which has my analyzing the situation again and looking for some type of answer. I’ve done research online and have posted about it still with not any ideas about it from others. I’ve also researched the moons phase based at that time and date to further prove there’s absolutely no way it is the moon, at that time and date the moon was about 50% full, making it impossible to see and entire complete circle having it be the moon. This independent research has lead me here. In going back over the event, I could swear it had happened much later at night than when it did but I can’t conclusively say there is missing time connected to the instance. I trust the time stamp and dates on the photos, both on 12/06/2016 one right after another at 9:05PM. After this event, I have not knowingly experienced anything else.